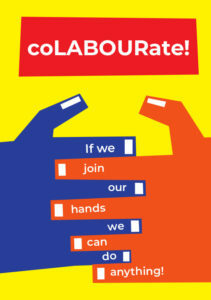 coLABOURate Resource Pack *English Edition* | coLABOURate Resource Pack *English Edition* – European Youth for Action! As a result of our 2018 Workplan ‘coLABOURate! Young people taking economic inclusion into their own hands‘, we’d like to share our resource pack that was created with input from all of our 2018 activities. If you’re interested in non-formal education youth work on the topic of economic inclusion, please check it out and get back to us with your feedback! And if you’re an individual interested in understanding more about workers cooperatives or mutual aid spaces, we feel we’ve collected some valuable resources for you too! We write this resource pack for people concerned already with environmental and/or social justice. And some of them might be asking themselves, why the big focus on economic topics here? Is there really such a thing as ‘economic justice’? Our approach to economic justice is multifaceted. And we continue to encourage broad coalitions and loud demonstrations taking a moral stance for economic justice to actually be put into action. But what we want to point to in this guide is how to approach it through locally identifying social and economic barriers facing underemployed or economically exploited/excluded youth and collectively devising ways of challenging discrimination and developing inclusive self-organised labour structures. 1. Labor market exclusion – makes it hard to get a job because of discrimination or the changing structure of the labor market. Exclusion from the labor market is likely to increase in the future as employers in the growing knowledge economy seek skills that vulnerable workers do not have. 2. Poor-quality jobs – have stagnant low-end wages and unpredictable hours, lack job security, and offer limited-to-no-career pathways. Poor job quality is widespread and growing across high-income countries, and globalization and technological advances may further erode wages and job security at the bottom. 3. Economic vulnerability – is exposure to financial risks. Economically vulnerable households lack assets to protect themselves from financial emergencies, such as a job loss or a health crisis. And the social safety nets that should support these households are inadequate or have weakened in recent years. 4. Isolation from opportunity – occurs when low-income people and minorities live in neighborhoods without access to jobs, good schools, health care facilities, and public spaces. Economic segregation, where the rich and poor increasingly live in separate neighborhoods, appears to be on the rise in most large cities. Youth’s participatory inclusion has become so pressing in the face of neo-liberal aspects of the labour market and rising austerity. A profound deficiency of workplaces, insufficient salaries, freelancing as a precarious norm or lack of social benefits are only examples of the factors that create unstable and unsustainable economic conditions for youth workers. Youth are disproportionately faced with unpaid internships or short-term contracts. We observe youth workers facing dual pressures to constantly adjust their skills to fit the labour market’s demand, while facing structural barriers (e.g. rising tuition costs) of formal education, which have prompted us to outline strategies for enhanced community-based self-educating and skill-sharing. Included in order to lay the groundwork for equal employment, we share several workshop modules that delve into both analysing barriers and devising strategies to overcome exclusion-based challenges. These modules were developed in collaboration with experienced trainers and respond to the needs of precarious youth workers in different parts of Europe.